It's a chrome towel rail for two towels, 50cm long. It looks somewhat similar to a "Grohe Essentials". Basically, this is simply a combination of cylinders. I thought about which parts the real thing might be made up and then built it that way in FreeCAD. Then, I used the fillet function on almost all edges with different radiuses. For this object, everything can be done in FreeCAD's "Part" view. One small detail for a realistic appearance is, that the upper and lower bars are arranged with an angle. When arranging this using the "placement" in FreeCAD, it is important to set the rotation axis correctly aligned with the center of the holder part for the bar. I actually built the upper bar with it's holder first from two cylinders, merged and rounded. Then, I mirrored it for the lower bar. The wall mount is also made of two cylinders, plus an additional one for the cover (it's a separate part which slides against the wall to cover the screw heads, therefore it's not merged with the actual wall mount). When all the parts were ready, I rotated the bars and positioned everything so that it's correctly aligned. To get the chrome appearance, I used a trick: after exporting the design from FreeCAD as a .obj file, I imported it to Sweet Home 3D, only to add it to a new "House" project and then export it from the 3D-view again to a .obj file. Sweet Home 3D then creates the .obj file, and a .mtl file containing the material definitions. Then I opened the .mtl file of another object, which had the surface I wanted, in a text editor (actually, the object was a mirror). Using the text editor, I copied the material definition from the mirror to the material file of my towel rail. Works perfectly! Of course, there would have been other ways to create a suitable material. I've already experimented with Blender, but for me and for the task, it appeared too complicated. By the way: the images above are rendered using the picture function in Sweet Home 3D's 3D-view window. 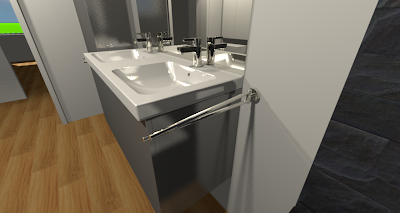 If you'd like to use my towel rail for your project, you can download it here. I hope you like it, or maybe found some inspiration to make something similar yourself. Of course, my explanation of how I created it is not a step-by-step recipe, but with some help from the programs' websites or google, it shouldn't be too hard to try yourself.